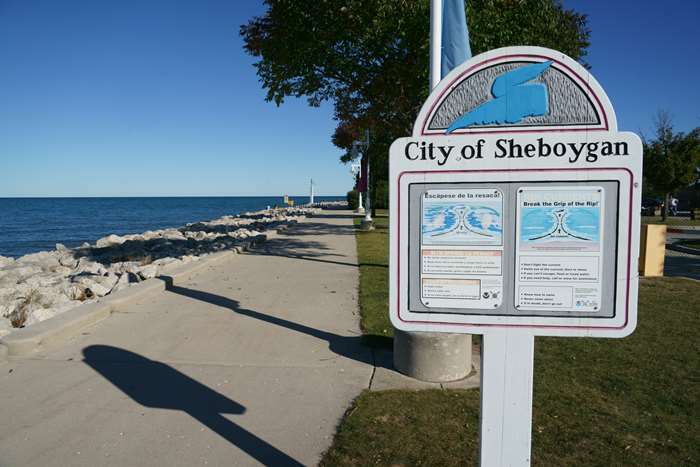 Sheboygan just sounds like a fun place to visit. And I found something fun to do there: take a long walk out along the city’s northern breakwater pier, all the way to the lighthouse at the very end, overlooking the city’s harbor. 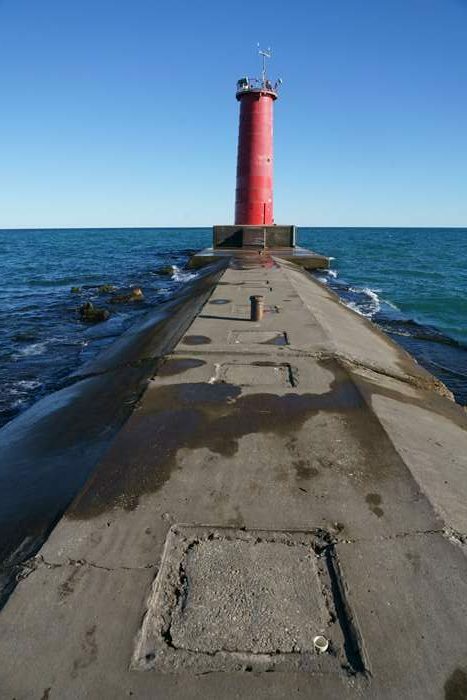 Sheboygan’s breakwater lighthouse is not the prettiest thing you’ll ever see, but the walk out to it is an adventure. You can access the breakwater wall from Deland Park. From downtown, take any road east towards the water, and you’ll run into Broughton Drive and Deland Park. Parking is available near Harbor Centre Marina, which is near the end of the breakwater pier. When I arrived in Sheboygan, I wasn’t sure what I’d find or where I was going (as you’ll see in the Drivelapse video, down the page). I figured my best bet was to head towards Lake Michigan, so I made my way over to Deland Park. 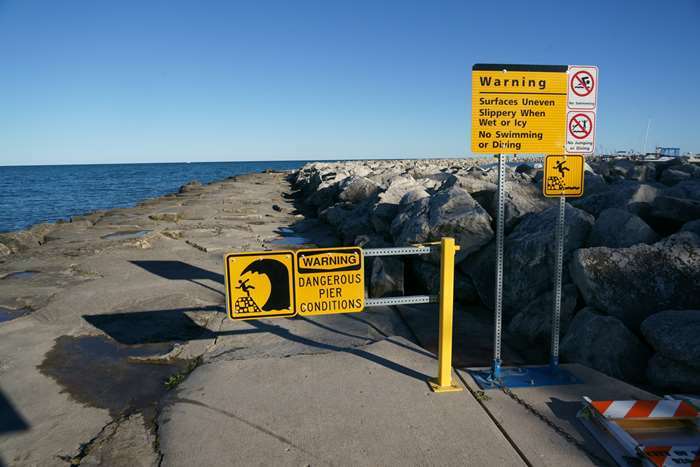 Not far from the parking area, you’ll be able to access the water, and you’ll find a way out to Sheboygan’s breakwater lighthouse, at the end of a long pier. The city sends some mixed messages about whether or not you’re supposed to go out here. There are plenty of warning signs, and on the day I visited, there was also a “closed” sign — albeit knocked over (you can see it there in the corner). I was reassured to see other people walking out to the lighthouse, so I decided it must be okay. 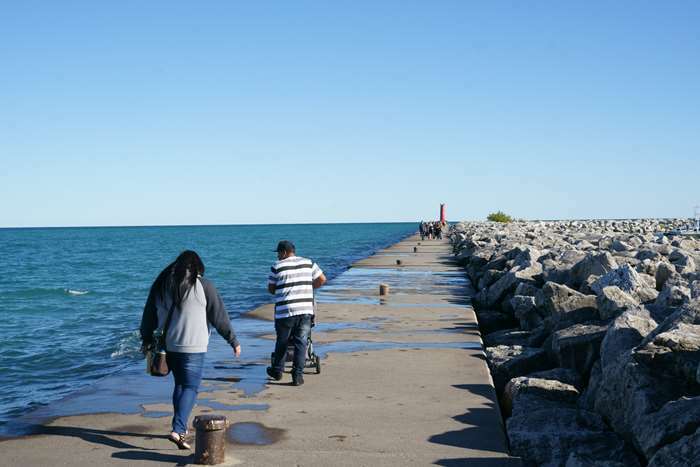 The first part of this walk out the breakwater feels pretty safe. There were waves crashing over the left side, but the right side was built-up with huge boulders. This wide path doesn’t last forever, though. As you get closer to the lighthouse, the path is only about ten feet wide (I’m estimating), and it looks like the crashing waves have pushed the concrete slabs out of alignment! That’s somewhat unnerving, but then it gets even scarier. The final stretch to the lighthouse is the narrowest part. The concrete walkway slopes on both sides, leaving you with just a few feet of width. It’s fine if you’re the only person, but when you have to pass a group of people coming the other direction, you realize just how close you are to those angry waves. The lighthouse is, well, pretty ugly. The cast-iron hull dates back to 1905. 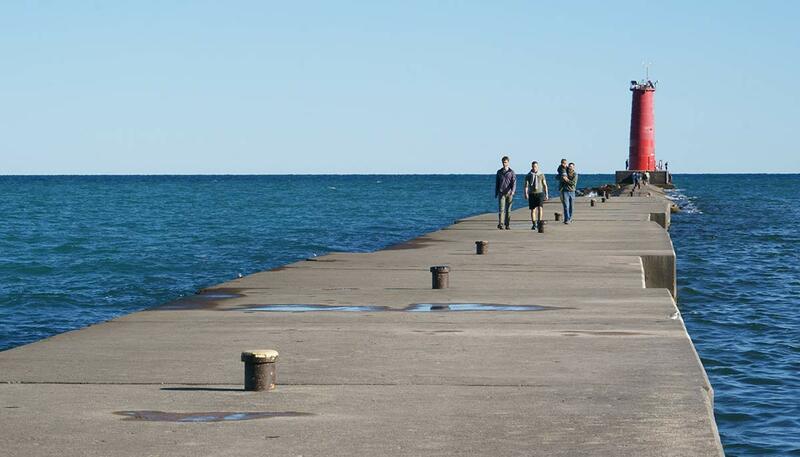 When the breakwater was extended in 1915, it was moved from the old end of the pier to the new one. 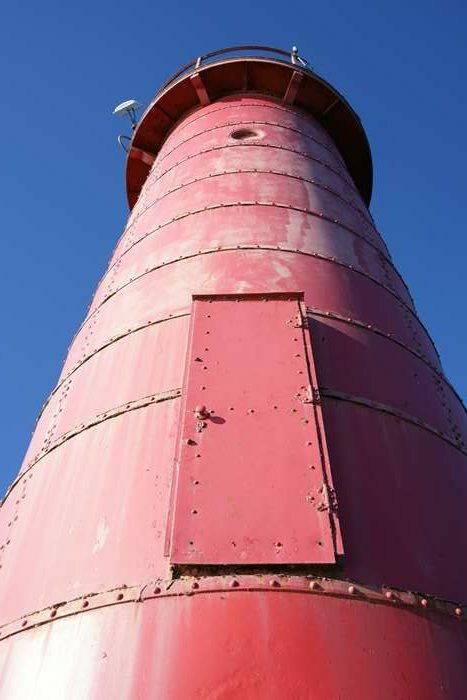 The lantern room and third-order Fresnel lens was removed during modernization in the 1950’s, which is when it started looking less attractive. The tower still has a light, as well as some weather monitoring equipment. You’re free to walk right up to the tower, but you can’t go inside. Once I finished my hike out to Sheboygan’s breakwater lighthouse, I backtracked into downtown for a quick look around. 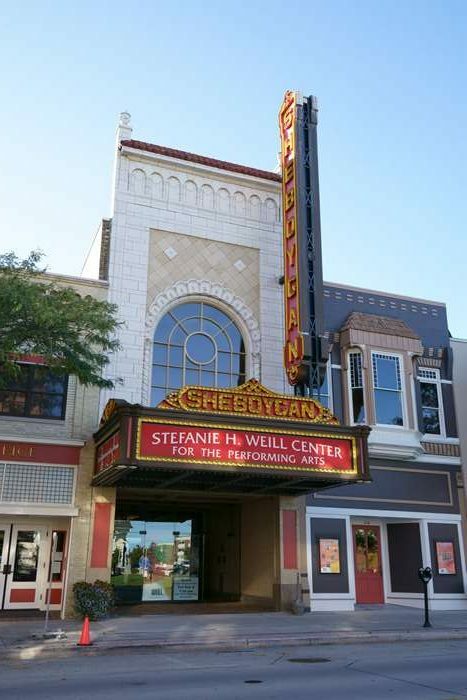 The old Sheboygan Theater dates back to 1928, and was remodeled in the late 1990’s. It is now known as the Stefanie Weill Center for the performing arts. 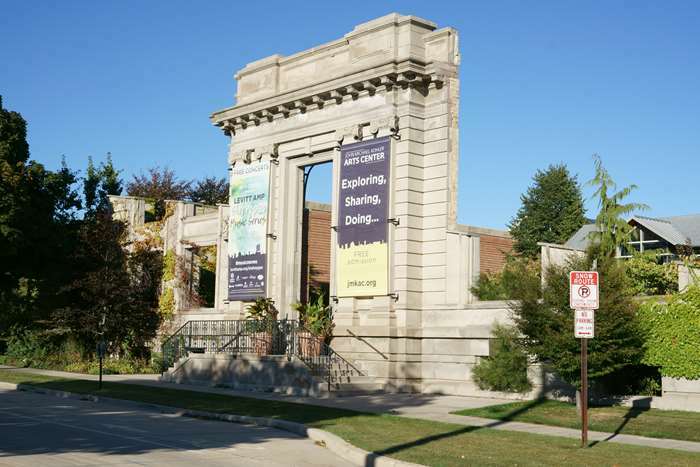 I also noticed the facade of Sheboygan’s old Carnegie Library. It stands in front of the Kohler Arts Center on 7th Street. 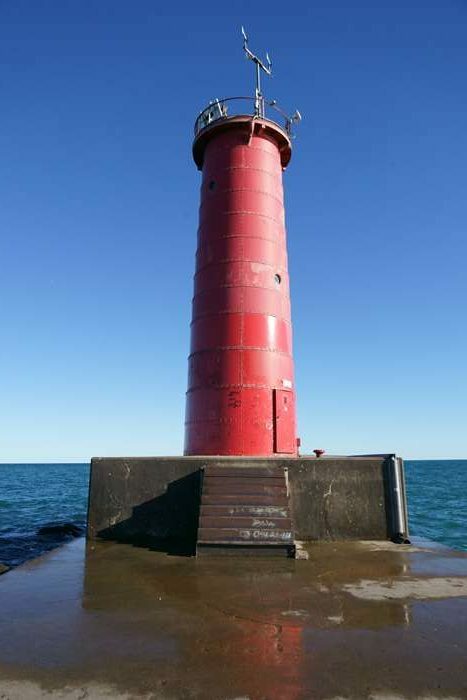 If you have time, it’s a lot of fun and only a little scary to walk out to Sheboygan’s breakwater lighthouse. Use caution and stay out of the water!